For years I’ve pled with any news shooter who would listen to diversify their skills, to master the script and the timeline as well as the lens. No longer can a TV news photographer afford to specialize, I’d say - for a revolution is at hand, one spurred not by a quest for better broadcast journalism but by shrinking technologies and the lust for smaller budgets. Most often, my exhortations were laughed off as folly, even as heresy by some in the camera community. This derision never bothered me much, as while the other photogs were babysitting Sally Joe Hairstyle down at the courthouse, I was back at the station, putting together MY story the way I wanted to. Now, I have the extra pleasure of actually being right. Since that doesn’t happen very often, I feel compelled to expound. Still, this is not a victory lap, or told-you-so, but rather an extended survey of the quaking media landscape. Just weeks ago, KRON in San Francisco chocked many in the broadcast world by announcing they were joining the VJ movement, forgoing the traditional two-person crew for a multi-tasking news-gatherer with a laptop and a lens. Under the tutelage of (the much-reviled in camera circles) Michael Rosenblum, this approach has already swept Europe, and small-market reporters have been shooting their own stuff since the dawn of TV news. But KRON is a former giant in a major market. For a station of that size to employ a one-person approach to news would have been unthinkable not so long ago. In many sectors of the broadcasting planet, it still is. Now, Young Broadcasting, KRON’s owner, is announcing that another of their stations, WKRN of Nashville, is jumping aboard the solo train. Not only that, WKRN is doing it NOW. Having already purchased 30 Sony Z1 cameras (at a mere 3 pounds apiece) along with 16 Dell laptop editors, KRN management announced an eight week training course that will transform 13 traditional news crews into 30 video journalists. While it isn’t yet clear as to just what reporters will shoot and what shooters will report, WKRN’s General Manager has divulged he won’t rule out letting any offended staffers out of their contracts. Wow. As you can imagine, word of this has caused many in the newsroom to panic and twitch. 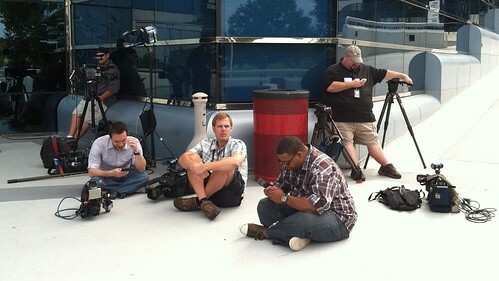 Reporters I know have no desire to pick up a camera, most fellow photographers dare not pick up a pencil. I can’t really blame them, as they’re merely adhering to the model laid down by the founding fathers of TV news. Unlike myself, most photogs prefer working as a team, concentrating on the art of capturing moving images while the reporter gathers detail and perspective. Likewise, what reporter wouldn’t prefer being able to focus on the story at hand while his partner did all the heavy lifting? If not for my anti-social tendencies and diminished tolerance for histrionics, I too might like company in the news unit more than I do. As it is, I shoot, write and edit daily news reports all by my lonesome because I feel I do my best work that way. Call me an auteur. I’ve been called worse. As entertaining as some of the teeth-gnashing, it may be a bit uncalled for. It’s a certainty that more and more stations will adopt the Video-Journalist model; you haven’t got to be Michael Rosenblum to see that. However, there are shades of gray involved. Affiliates will have to keep a certain amount of shooters on hand to produce more in-depth work, as well as to support the stable of front-line talent. Jill Reporter-Bunny might shoot her own stuff, but chances are Chet Graytemples won’t pack his own lens when he saunters off the set long enough for a series shoot. If he does, then that would be a revolution, one in which the star-making nature of your local news factory might indeed crumble. Imagine a TV newsroom where even the top anchor schleps gear, thus tarnishing the artifice of suave superiority inherent in the dapper newsreader model. While that’s not likely to happen, one aspect of the changing times does excite me: the gradual transformation of local correspondents from overdressed poseurs to blue-collar news gatherers. Blasphemy you say? Perhaps, but a newscast focused more on stories than storytellers is one even I might watch. Might. But I digress. What will most probably transpire is an amalgamation of the fears and concerns wafting over the internet right now. Depth and aesthetics WILL suffer, at least until practitioners of these new methods get the formula right. Even then, TV news won’t be the same. Higher story counts will be delivered with far cruder execution. Smaller, lighter lenses will open up new frontiers, but it will be a bumpy, often out-of-focus ride. Reporters will still go live(!) for no apparent reason, but they may be a little more out of breath from shooting and editing their own stuff. Legions of reporters and photogs opposed to cross-training will leave the fold, making room for a new generation of loners with lenses who will merrily take their place. Not so long from now, this group of 21st century newsies will sit around their magic laptops, wi-fi wristbands and sat-dish jetpacks, and wonder what all the fuss was about. Until then, I’ll see ya in the camera scrum. I've been told by a reporter there that they could get out of their contracts. Interesting stuff... who would have ever imagined the day when going live meant going it alone? Bring it on, baby!! I'll pit my newsgathering skillz up against any of the "reporters" currently working in my shop any day of the week! Let's get it on... Survivor style! I think the pics will wind up being fine. The reporter types will get acceptable images and the photog types may even use the freedom of lighter gear to get more creative. It's the journalism that'll suffer, as suddenly, reporters have half as much time to devote to gathering facts. Anyone remember Edison Carter of "Max Headroom" fame? I always thought Edison Carter was cool. Jeez, I think the 'much reviled in camera circles' is a bit harsh. I may not be the most popular person on b-roll.net, but there are plenty of cameramen who like me and like the idea of working in this way. I struggled over 'reviled' at the time but it just felt right. I however, hold no malice over your work - as I've attempted to state before. There is much misinformation out there, I'd welcome the opportunity to interview you Mr. Rosenblum and clear some of thbat up. Get with. FYI Larry Hatteborg of KAKE Wichita KS has been shooting, writing and editing his own stuff for years while also being a lead anchor so there is at least one out there not afraid to sweat and schlep his/her own gear etc. And his stuff ranks with some of the best NPPA things I've seen so content or quality don't seem to suffer. Happy to talk any time. I am in Nashville at (no surprise) WKRN t the moment. You can always reach me at Michaelrosenblum@yahoo.com. Looking forward to it. I think what is it interesting is that WKRN is having a class for any blogger interested in producing a story for the news. I think this might(a big might) blow up in their face. Bloggers have a habit of not checking sources. NashvilleisTalking.com called Peggy Phillip a photog in refrence to her blog. She is a news director. Nashvilleistalking.com is a WKRN sponsored blog. The blog now has it right, but initially it was wrong(I bet the picture on the Peggy's site is where the wrong info came from). This happens all the time. Blogging is not necessarily journalism. I think what could happen is that a video story by a blogger could be very slanted to their point of view and when a producer or news director wants them to reedit the story to prevent a lawsuit the blogger might not like it. Of course they will then blog about how the station is scared to air their story. It could be a plus...WKRN might get exclusive blogger video. There will need to be fact checking on the backend by WKRN. I hope staged video does make air either. Just some thoughts and keep up the nice blog lenslinger. One advantage to this approach is that we will see less footage of the tv person him/herself? Standing in front of highways holding a mic? More footage of whatever it was the reporter was sent out to cover? As a videographer with a journalism degree I have been doing the vj thing for years and having to fight the unions to do it. When I shoot I have a story in mind and love being able to edit it as I experienced it, instead of some reporter's version. It's like a director who directs his/her own scripts or a children's author who illustrates her own stories - it's a much purer version of the truth and for someone with that kind of talent there's room for amazing creativity - In my 15 year, five-market experience including Boston and Seattle, most reporters AND photogs are often too lazy and too afraid to step beyond their comfort zones and stretch. They fight anything new that threatens the status quo. History has proven those folks will be left in the dinosaur dust. Gimme a creative challenge any day! And congrats to the management at Young and WKRN for going for it!! ...Yeah, some stuff will suffer but local news needs the challenge - it's stuck in the mud right now and is totally ridiculed by anyone with a brain. I was just searching blogs and found yours.It's interesting. I'm going to bookmark you and return. Social Bookmarking Tag Your Favorite Websites Now! Sometimes it happens that for the same ailment different treatments are offered by different doctors. This confuses the patients to a great deal. Which treatment to go for, which doctor to follow etc, etc. Under these circumstances people can refer to the patient info sites where they can get all the information regarding the disease, its treatments, prices etc. Elidel skin care medicine (pimecrolimus) is used to control the symptoms of atopic dermatitis (a skin disease that is also called eczema). Pimecrolimus is only used to treat patients who cannot take other medications for atopic dermatitis, or whose symptoms were not controlled by other medications. Jami Turner - back in action!